Your perfect vacation home! Spectacular views from this well maintained home in Shy Beaver Estates. Located just 40 miles from State College/Penn State. 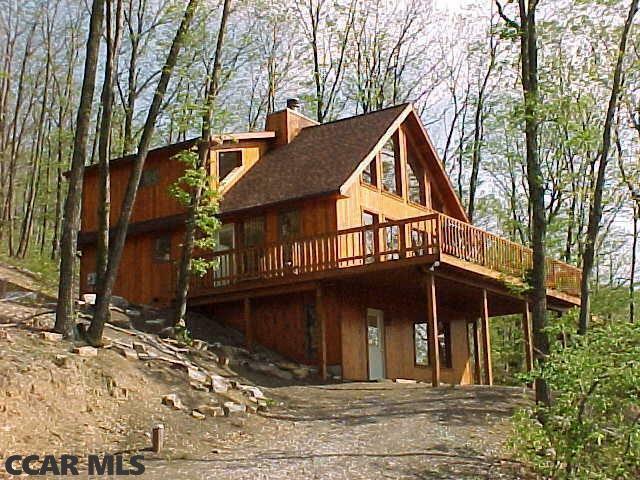 Cedar sided lodge style home with wrap around decking/porch for relaxing and enjoying mountain side views year round! Living area has floor to ceiling wood burning fireplace, and vaulted ceiling. Well placed windows create natural light and bring the beauty of the outdoors inside. 2 large bedrooms, full bath and a loft area upstairs. Additional bedroom area and full bath in lower level along with laundry room and rec room. Central air/heat pump keep it comfortable year round. Walking distance to Raystown Lake boat launch and fishing areas. Close to hiking/biking trails, state forest and Trough Creek State Park. Dont miss out on this breath taking beauty! Schedule your tour today!